Printed Matter, Inc. and The NY Art Book Fair will take over all three floors of MoMA PS1, November 5–7, to present 275 international presses, booksellers, antiquarians, museums, galleries, and artists from twenty-four countries, exhibiting the very best of contemporary art publishing. The Fair will open with a preview on Thursday, November 4 from 6-9 p.m. Admission to the preview and to the Fair is free. Alongside the Contemporary Artists’ Books Conference and The Classroom programming schedules, the NY Art Book Fair will include the special exhibition You Are Her, organized by Goteblüd (San Francisco), a collection of more than one thousand Riot Grrl zines from the ’90s for reading and photocopying. 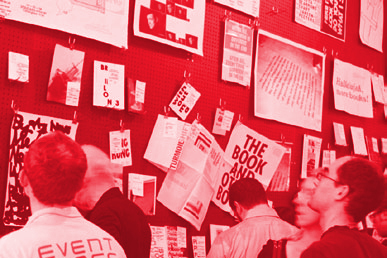 The NY Art Book Fair will also include project rooms organized by several publishers. Bedford Press & AA Bookshop (London), in collaboration with artist Joseph Grigely, will present Exhibition Prosthetics, an examination of art, architecture, and the conventions of exhibition production; Andrew Roth (New York) will present Ten Years of PPP Editions, a retrospective of work examining the historical intersections of photography and book art; e-flux (New York) will map a cosmology of texts, ideas, and contributors for its journal; Electronic Arts Intermix (EAI; New York) will present a screening program featuring new and historical video works drawn from its extensive collection; Fillip (Vancouver) will operate a free-distribution center for critical texts from the database of AAAARG.ORG (Los Angeles); PictureBox (Brooklyn) will present a survey that includes work by graphic artist King Terry, imagist Karl Wirsum, and horror-core draftsman Mat Brinkman; and students of Werkplaats Typografie (Arnhem), the Dutch super-school, will establish an alternative economic system for design services. • The Netherlands, this year’s featured country, presenting public programs, book launches, and a project room by Kunstverein Amsterdam and Witte de With (Rotterdam), alongside seventeen other Dutch publishers. • Leidy Churchman’s series of facsimile book paintings on wood, drawn from the stacks at the Museum of Modern Art Library to trace a unique portrait of artists’ publications over the last century. • Zines by Artists, a lively selection of international zinesters who represent independent publishing at its most innovative and affordable, including The Holster (Brooklyn), Nieves (Zurich), Ooga Booga (Los Angeles), and ZINE’S MATE (Tokyo), alongside a special section of queer zines, including Girls Like Us (Amsterdam), Little Joe (London), Original Plumbing (San Francisco), and PINUPS (Brooklyn). • Limited editions published by Printed Matter, including new prints by artists Rachel Harrison, Christian Holstad, William E. Jones, and Misaki Kawai. • The Contemporary Artists’ Books Conference, featuring a keynote discussion between Richard Hell, Josh Smith, and Christopher Wool. Full conference tickets, which include a newly commissioned book by Emily Roysdon, are now available online (single-session tickets are also available). • Special performance by Norwegian artists Nils Bech & Bendik Giske during the Fair’s opening reception, Friday, November 4 from 6-9 p.m.
Visit www.nyartbookfair.com for a complete list of exhibitors and programs.